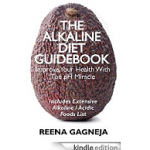 I’ve been working on my first Kindle eBook, The Alkaline Diet Guidebook, for some months now. And now, amazingly, it is finished and published! It’s hard to believe as I can be a bit of a procrastinator especially when it comes to getting oh so close. But with a bit of a final push I have done it. If you find it useful then please leave me a review on Amazon – I would love to hear your views and your review will help me to get the word out about the ways in which we can improve health by simple changes to our diet. The Alkaline Diet is not a diet for weight loss, but rather changing eating habits to incorporate more alkaline foods so that we achieve pH balance, as most people (certainly in the West and where fast foods and processed meals have become the norm) are too acidic. The impacts of eating too much acid-forming food (sugar, sweet things, processed foods, tea, coffee) can range from lesser health issues such as fatigue and skin problems, right the way through to cancer. I’ve posted here before about cancer cures such as bicarbonate of soda which some natural cancer doctors are using. I also posted about my improvement with a long-term digestive problem through using lemon juice, which are alkaline once in the body. The medical profession is not agreed on the alkaline diet however, nor on definitively focussing on pH balance, but some proponents of the alkaline diet would even say that the single most important measurement for your health is the pH – more vital even than blood pressure, cholesterol count, blood sugar, hormones and calorie count. Be that as it may I don’t doubt that too many acidifying foods are harmful to our health, so being interested in this topic, and having been researching it, I decided to write about this in an eBook. The Alkaline Diet Guidebook is a comprehensive guide to help you change to a more alkaline diet, lose weight and improve your health. The great thing about this book, unlike many others, is that you will get a list of 400+ alkaline foods and acidic foods by degree – possibly the biggest list available. And these lists are maintained on this site itself – scroll down for more info. 10 vital alkalising tips for how to make this diet a lifestyle change, not just some fad you do for a few weeks! So I hope you’ll grab your copy of the Alkaline Diet Guidebook today and find out how alkaline foods can be easily adopted into your daily lifestyle for powerful health improvements today. The extensive list of alkaline and acidic foods is now also published as a page on this site – click the link below. These are probably the biggest such lists easily available on the internet for free! …and do forward to family and friends who you think may find the information useful, and do leave me a review! Thank you!